On a Wednesday I usually attend the Cudworth History and Heritage Group meeting at Cudworth Library (aka Cudworth Centre of Excellence) but this morning the bright, if cold and windy, day inspired me to try my first solo adventure of the year. Since solving the mystery of the OH's great-grandmother Edith Alice in 2009 and discovering the family links to Hemsworth we have visited the village (small town?) on several occasions. A new Wetherspoon's pub opened there two years ago, to which the OH regularly delivers his Barnsley CAMRA magazines and there is a handy Tesco store when the one at Stairfoot runs out of cat litter (the only thing we regularly buy at Tesco to be honest). 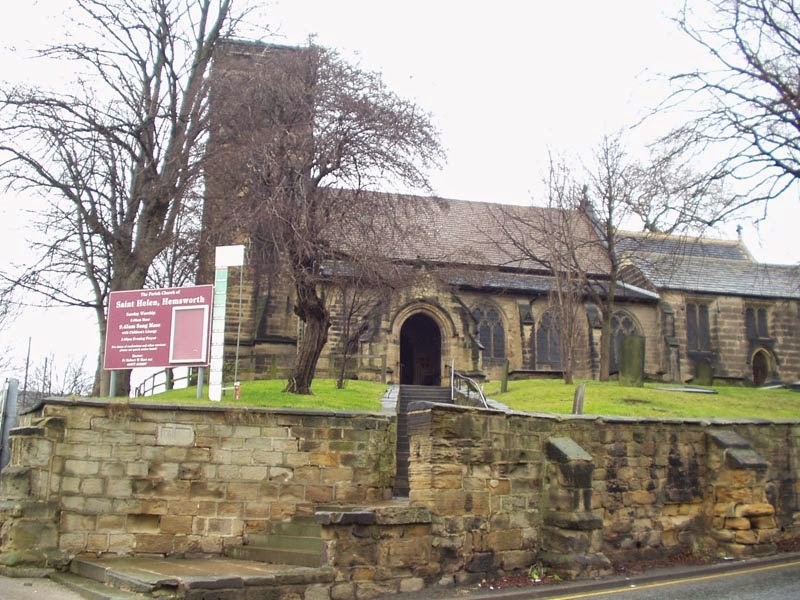 I have a file of photos from January 2010 which includes photos of the outside of St Helen's Church, the memorial at Kinsley to both World Wars and the new looking memorial in Hemsworth to the Second World War. But it has taken until just recently to ascertain that there is, in St Helen's Church, a memorial to the First World War. One of the problems has been gaining access to the church, which opens only for services and a coffee morning on a Wednesday. I have been reluctant to miss the Cudworth LLHG meeting to make the 45 minute each way trek on the bus (via Shafton, ASOS, Grimethorpe, Brierley and all points east) to Hemsworth as it would, and indeed did, take all morning. However, it was worth it! As you can see above (click the photo for a larger view) there is a large memorial in the Lady Chapel of the church. 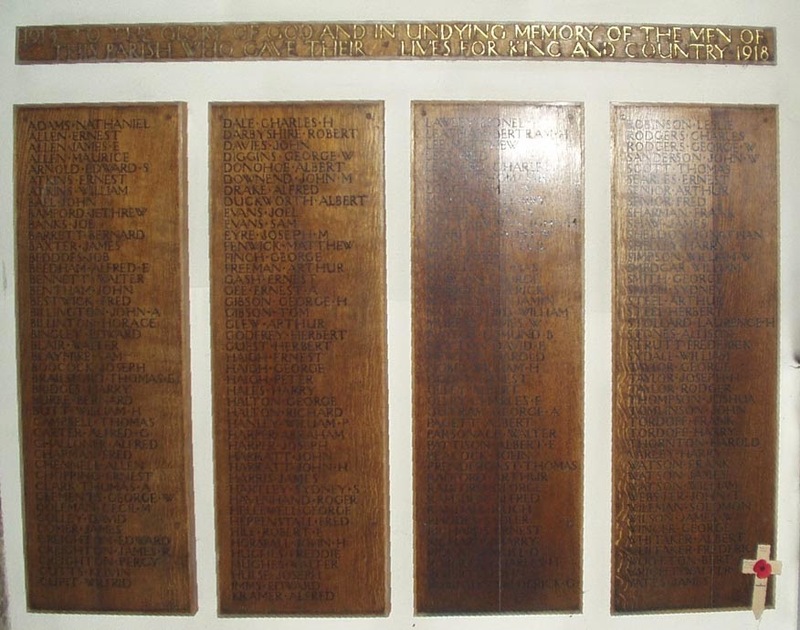 It consists of a separate header reading, "1914 To the Glory of God and in Undying Memory of the Men of This Parish who gave their Lives for King and Country 1918", and then underneath four separate wooden panels each listing 40+ names. I make it a total of 173 names - but that was a quick count on my screen, I haven't tried transcribing the names yet. 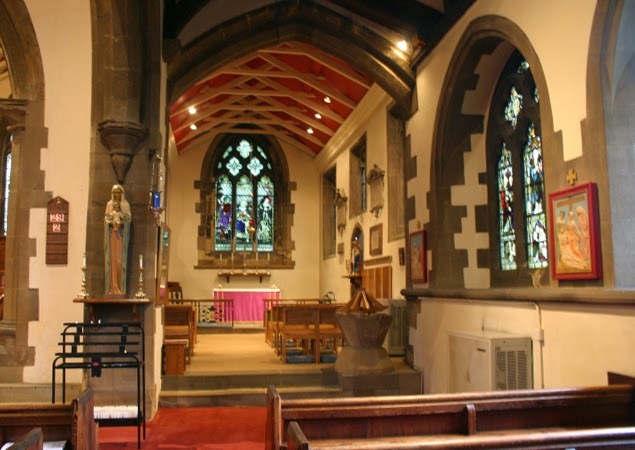 This is where the panels are in the church, look in the middle distance on the right hand wall - the photo above is from the church's own website - but I'm sure they won't mind, they were very friendly this morning when I explained that I was looking for my husband's Pagett soldier cousin. One gentleman even remembered an elderly lady called Pagett in the 1960s and we wondered if she might have been a relative. 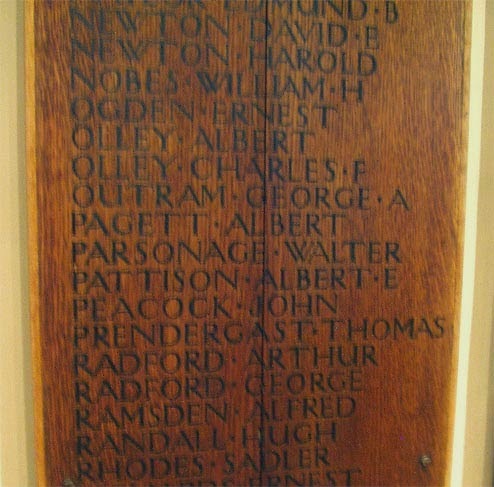 This is a close up of the third panel where Albert Pagett is listed. He is actually the OH's 3x great uncle, being brother to his great, great grandmother Minnie, mother of the Edith Alice mentioned at the start of this post. Albert Pagett must have joined up shortly after the start of the First World War as he arrived, according to his medal card, in the Balkans - part of the Gallipoli campaign - with the Connaught Rangers on 21 July 1915. His brothers Will and Enoch also served in the war, but they returned home to Hemsworth. Albert died of wounds on 13 September 1915 and is buried in Portianos Military Cemetery on the island of Lemnos, Greece where there were several military hospitals. Presumably Albert was evacuated from Gallipoli to a hospital where he subsequently died. He was 26 years old. So, there we are, another WW1 ancestor commemorated. It is a special year of remembrance for the Gallipoli campaign, as it was 100 years ago on 23 February 1915 that the first landing was made there. Thousands of men lost their lives in that campaign - and Albert Pagett from Hemsworth was one of them. Edit 4 Apr 2015: I have since created a page for this memorial on the Barnsley War Memorials Project website; there are 172 names (told you it was a rough count!) which I have transcribed.